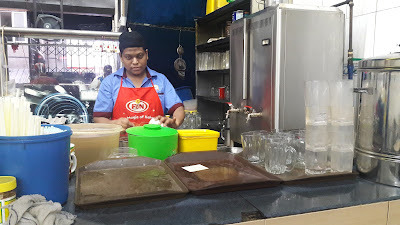 A visit to Malaysia is not complete without having a glass of the famous Mamak Coffee Tarik. It is a typical backyard-instant-coffee prepared by the mamaks. It is sold at tea stalls and restaurants and served in glasses. This coffee is usually enjoyed with a Roti Canai (a type of flatbread). The mamaks are just regular friendly Malaysians of Tamil Muslim origin. 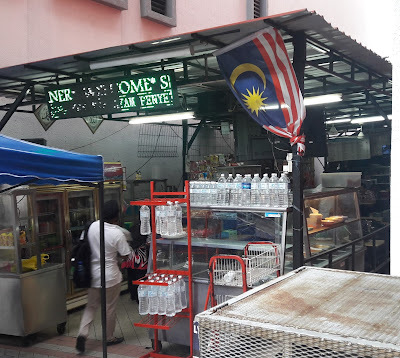 If you still can’t find a stall, ask any local. He may even take you there himself and join you for a cup of coffee or tea. The taste of this coffee, in my opinion, depends on how fast & how much coffee is scooped out. Also, important, is the quality & amount of condensed milk poured into the mix and the water temperature. In other words, it is a skill that's acquired. Most established mamaks have perfected the art of preparing this to a similar consistency each time. The word Tarik means ‘pull.’ It occurs where steaming hot coffee is poured from one stainless steel container to another. This is done to cool the coffee temperature and to form a layer of foam. The Tarik is an age-old tradition that originated from the Indian sub-continent. I particularly like the coffee served at outdoor stalls, and yes, the tropical heat adds other natural and unique ingredients too! My first ever outdoor-night mamak coffee experience brings back sweet unforgettable memories of Maybank. This was where I had once worked. I have fond memories of my colleagues and the ‘camping at work days’. Shift B was on duty that night. Knowing how naive I was, during their break, these Shift Taiko’s or brothers decided to show me a bit of Kuala Lumpur during the wee hours. I must admit at this point, that my sisters and I had a somewhat conservative upbringing so going out at night without my parents was non-negotiable. But work was different, and it was a responsibility to fulfil. He is fixing me a glass of coffee. Now back to that night. I had no idea what to expect but seeing these fantastic neon city lights blinking in my eyes and seeing so many cheerful people from all walks of life sipping coffee at the Puduraya stalls simply got me exhilarated. The city at 3 am was different and it was alive! After that night, I don’t recall ever saying no to batch support duty. Later, over the years I had worked for several other banks, and I continued providing integration support at night. I did this during project cut-overs and made many more close and trusted friends from all races and age. This coffee-experience united us then and continues to do so today. The mamaks, like the taikos, are generous and affectionate people but in different ways. Their kindness is often displayed in abundance through their hospitality and food. They also like to make sure the coffee is sweet! So, if your personal goal is to keep sugar levels under control, take this coffee in moderation, common sense will tell you what is best. Because coffee is affordable and tasty, it is also popular. More importantly, for me, it is unpretentious. You can try preparing it at home, but after several attempts, you'd probably be back to the stalls. Some days you’d even get a chance to meet a celebrity or two there. 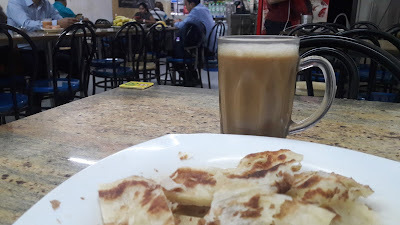 Today, just for you, I decided to have some mamak coffee tarik and roti canai.